The chihuahua is a very popular little dog and, like any breed of dog, has a definite personality as seen by the various chihuahua traits that set them apart from other dogs. Chihuahuas are surprisingly brave and their personalities are much bigger than their little bodies would suggest. Sweet. Chihuahuas can be gentle, charming, sweet and adorable. Loyal. Chihuahuas can be devoted to their owners. They are loving and affectionate and are not afraid to defend their territory. Great watchdogs. Despite their diminutive size, Chihuahuas are very good watchdogs and will warn you vocally about any strange noises or intruders. Spry and alert. Chihuahuas are quick, agile and very awake. Brave little dogs. Don’t let the size of a chihuahua fool you. They have big hearts and personalities tucked into a pint-sized frame. They are kissers. One of the most endearing of chihuahua traits is that it likes to kiss the one it loves. Two Chihuahuas together will lick, clean and preen each other. Born entertainers. Chihuahuas are amusing, lively and comical. Quirky and eccentric. Chihuahuas tend to take themselves quite seriously. Each dog has a unique character due to the inherent intelligence of the breed and some are oddballs. They love to cuddle. Chihuahuas love to burrow in blankets and like to snuggle up. They like company. Chihuahuas are great little companion dogs and will go with you everywhere. Easy to transport. It is easy to tuck a chihuahua into a handbag and he will happily rummage around to get comfortable. Every dog has a downside and the Chihuahua is no exception. Health problems. All purebred dogs are prone to health issues and the Chihuahua has his fair share. Some problems are directly related to his size, like low blood sugar. The metabolism of a Chihuahua is high and they burn up energy fast. Dehydration is another risk factor as well as respiratory problems. They don’t do well in extreme heat and get cold easily. They tend to wheeze and snore. Having said all this, though, Chihuahuas can live a long healthy life of 15 years or more. Not bad for such a tiny mite. Can be nervous and snappy. Depending on how a Chihuahua is bred and how it is brought up, it can be nasty if allowed to rule the roost. This is not an inherently laid-back dog but a high-energy live wire. Not good with other dogs. Chihuahuas prefer their own kind and do not generally get on with other dog breeds or with cats. Can be strong willed and territorial. Chihuahuas don’t like to share. This makes them perfect as a pet for a single person but they are not really suitable as a family dog. 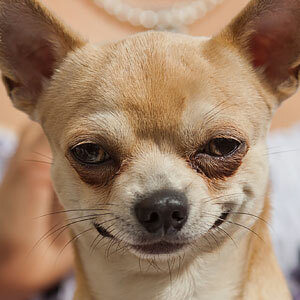 Chihuahuas can be among the most characterful of dogs. All the wonderful and varied chihuahua traits ensure that you get a whole lot of dog in a small package.